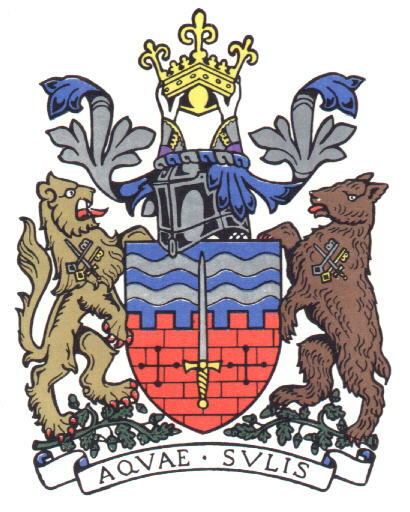 A depiction of the city’s coat of arms in the Guildhall. You’ll come across various visual interpretations of Bath’s coat of arms around the city but the one l am showing you is based on the earliest depiction from 1568 in William Smith’s Particular Description of England – now in the British Museum. 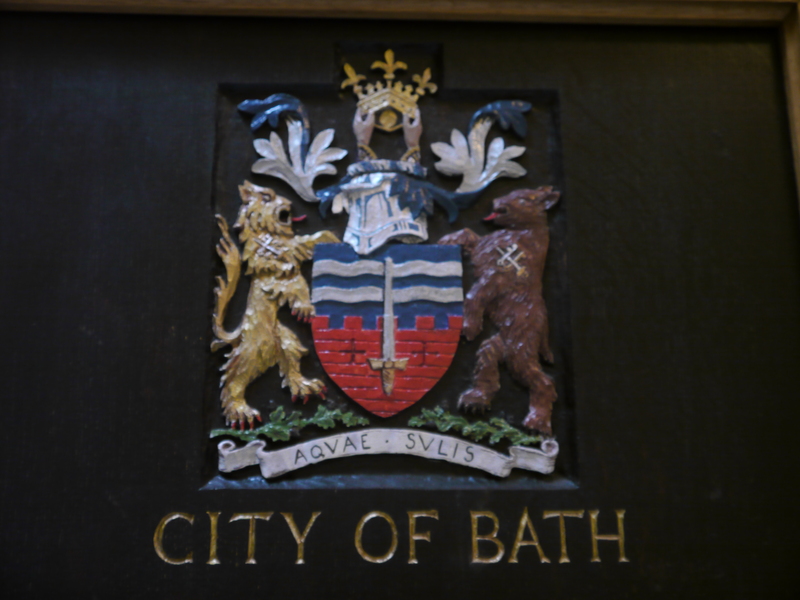 Ownership of the Arms transferred to The Charter Trustees of The City of Bath, upon the cessation of Bath City Council in 1996. It continues to be used by the Mayor of the City of Bath and also The Charter Trustees (only), on official documents and their web site. Bath & North East Somerset Council, a separate Authority, are not allowed to use it, and they have their own ‘logo’. Let’s take you through the coat of arms from bottom to top. The motto – Aqua Sulis or Waters of Sulus – is the Roman name for Bath. A lion and a bear hold up the shield and stand on oak branches with acorns which are linked to King Bladud – the legendary founder of Bath – and the man feeding his pigs acorns when they ran off to discover the steaming mud and thermal waters of the hot springs. The lion stands for bravery, valour, strength and royalty. The bear for strength, cunning and ferocity in the protection of one’s kindred. The shield depicts the town wall, the mineral springs and River Avon and the sword of St Paul – one of the patron saints of Bath Abbey – which is also the town’s parish church. The lion and bear also display the crossed sword and keys – representing both patron saints. St Peter – who held the keys to the kingdom of Heaven – shares the protection of the Abbey with St Paul. Above them the crown of King Edgar – first king of all England – is held aloft by the arms of St Dunstan who performed his coronation in Bath in 973 AD.